The Ostroy Report: Yes, the F**king Tweets Matter! has happened to America? Are we actually having a legitimate ‘debate’ as to whether Donald Trump’s tweets are ‘official’ statements? Is his bar that low? Has he lowered our standards of presidential behavior to the point where nothing seems rational anymore? Like we’re all now living in his alternate universe? People... have you gone mad!? Let me attempt to inject some sanity into this utterly insane discussion: It doesn’t matter whether Trump (a) addresses the nation on prime-time television; (b) holds a press conference; (c) issues a written statement; (d) gives a radio address; (e) Tweets; (f) shouts from a mountaintop; (g) or puts a note in a bottle and throws it into the ocean. Whatever he says, however he says it, wherever he says it... it’s an official statement from the U.S. president. Jeez, how the hell is this even a subject for debate?! 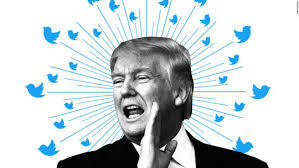 To the chagrin of his aides and lawyers, Trump uses Twitter to malign the media, the judiciary, the Constitution and anything and anyone who threatens or offends him including the Pope, the disabled and veterans, war heroes and Gold Star families. He uses Twitter to lie, distort and obstruct the ongoing investigation into Russian interference in our election as well as possible collusion by Trump and his campaign. Trump refuses to give press conferences, refused to answer a single question from American reporters during his European trip, and refuses to give the media and the American people any ability to directly question him about his actions and policies. He obsessively uses Twitter exclusively as his mode of communication. But we’re expected not to take his tweets seriously? Yes, his tweets count. They count when the 9th Circuit court uses them as a basis to uphold the block on his racist Muslim ban. They count when he unequivocally declares in caps that his travel ban is, yes, a “TRAVEL BAN.” They count when he unconscionably attacks the Mayor of London just hours after that city suffers a horrific terrorist attack. And they count when he uses it to announce his new FBI director. As the United States president, Trump is never “off.” Once elected, he gave up the right to have “off the cuff” remarks. And everything he says has impact domestically and abroad. It doesn’t matter the forum. If it comes out of his mouth, then it’s an official presidential statement. Trump and his surrogates need to accept that his mounting verbal gaffes and controversies — whether born on Twitter or elsewhere — are attributed to him and not the media, Democrats or anyone else. These are unforced errors created by the president himself. He needs to put on his big boys pants and say “the buck stops here” and stop the pathetic victim act. Trump promised to “drain the swamp.” But he’s instead pulled the entire nation down into it with him and we can’t breathe. The survival of the greatest democracy in history is at stake. Trump’s damaged our standing on the global stage, created chaos and uncertainty at home, and has turned the office of the presidency into a kleptocratic cesspool of corruption, greed and surrealism...and turned the White House into the Blight House. But what’s most astounding is that he’s become so unhinged that he’s making us irrational.